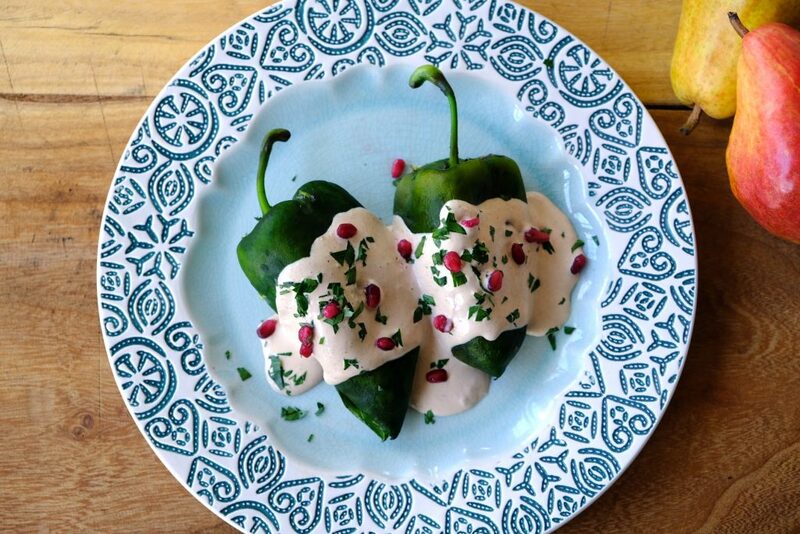 Mexico’s iconic Independence Day dish of poblano chiles stuffed with fresh and dried fruits, blanketed in creamy walnut sauce and dotted with glistening, jewel-like pomegranate seeds is a celebration of seasonality, color, and heritage. Many recipes call for multiple types of fruit in the filling, but this simplified version highlights fresh pears. Make the sauce: Preheat the oven to 350˚. Roast the walnuts until deeply toasted, 8 to 10 minutes. Transfer the warm walnuts to a clean kitchen towel and rub them vigorously in the towel to remove as much of the skins as possible. (Some skin left on is okay.) Place the walnuts in a blender with the crema, cream cheese, milk, sherry, sugar, salt and cinnamon. Blend to a smooth, creamy sauce. It should be very thick but still pourable, so add another splash of milk if needed. The sauce is best when made the day it will be served. Make the chiles: If you have a gas stovetop, blister the chiles on all sides over the open flame of a burner, placing them directly on the grates and turning occasionally with tongs until the skins are fairly evenly blackened. If you don’t have a gas stove, preheat the broiler with a rack positioned about 4-inches from the heating element. Arrange the chiles on a foil-lined baking sheet and place them under the broiler until blackened all over, turning occasionally, 7 to 10 minutes. Immediately place the roasted chiles in a heatproof bowl and cover it with plastic wrap to steam the skins loose. When cool enough to handle, scrape off the skins with the aid of a paring knife, but don’t be too diligent; some remaining bits of char are tasty. While the chiles are steaming, in a large skillet, heat the oil over medium-high heat. Add the pork and onions and cook until both are nicely browned, 10 to 12 minutes. Reduce the heat to medium, and add the garlic, oregano, cinnamon and allspice. Cook until aromatic, about 1 minute. Add the pears, tomatoes, raisins, 1 teaspoon of salt and several grinds of pepper and cook over medium heat, stirring occasionally, until the pears are very tender but not complete mush, about 15 minutes. Stir in the pumpkin seeds. Taste and adjust the seasonings. Cut a long slit, lengthwise, in each chile. Scoop and scrape out the seeds and pith with a spoon and paring knife. Stuff each chile with the filling, dividing it evenly. To serve, place the stuffed chiles together on a platter, or on individual plates, and pour the walnut sauce over the top, quite liberally. Sprinkle with pomegranate seeds and parsley, and serve warm or at room temperature. 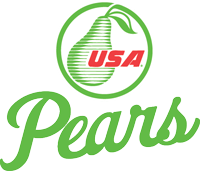 Make sure to follow USA Pears on Facebook, Twitter, Instagram and Pinterest for all things pears! This entry was posted in Food and Drink Recipes and tagged pear recipe, pear recipes, pears, recipes by Andrea Slonecker. Bookmark the permalink.